Debug your test automation for native and hybrid apps with BrowserStack's advanced tools. Leverage the full range of debugging tools provided by BrowserStack to easily debug your test automation for native and hybrid mobile apps. BrowserStack provides a range of debugging tools to help you quickly identify and fix bugs you discover through your automated tests. This guide will give you an overview of the tools available on BrowserStack to help you debug issues identified by your native app test suites developed using the frameworks like, Appium, Espresso, XCUITest or EarlGrey. Text Logs are a comprehensive record of your Appium test. They are used to identify all the steps executed in the test and troubleshoot errors for the failed step. Text Logs are accessible from the Automate dashboard or via our REST API. Instrumentation logs are the framework logs for the entire test execution. Instrumentation logs are available only for Espresso, XCUITest and EarlGrey frameworks. Instrumentation Logs are accessible via App Automate dashboard. Visual Logs automatically capture screenshots at every Appium command executed during your test. They help debug issues detected through your Appium tests. Visual logs help with debugging the exact step and the page where the failure occurred. They also help identify any layout or design related issues with your web pages on different browsers. Visual Logs are disabled by default. In order to enable Visual Logs you will need to set browserstack.debug capability to 'true'. Visual logs are available only for App Automate. Network Logs capture the app's performance data such as network traffic, latency, HTTP requests and responses in the HAR format. You can leverage Network logs to get a clear picture of all the requests your app is making, and the time taken for each of these requests. 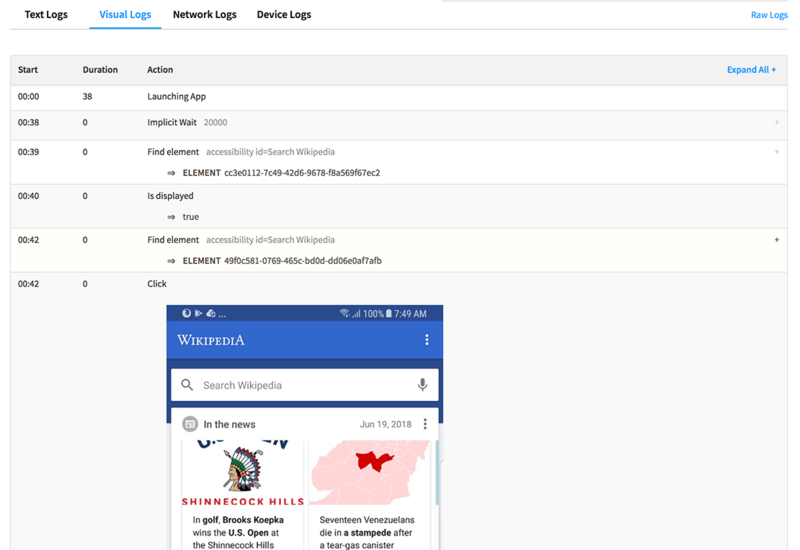 You can download network logs using the REST API or via the App Automate Dashboard. You can visualize HAR files using the HAR Viewer. Note: You may experience minor reductions in performance when testing with Network Logs turned on with Desktop sessions. Appium Logs captures the raw Appium Logs for your test execution. With Appium logs you can debug the test in case of any exceptions. Text Logs are accessible via App Automate Dashboard. You can also download logs using the REST API. Every Appium, Espresso, XCUITest or EarlGrey test run on BrowserStack is recorded exactly as it is executed on our remote machine. Video recordings are particularly helpful whenever a browser test fails as they help you retrace the steps which led to the failure. You can access the video recordings from App Automate Dashboard for each session. You can also download the videos from the Dashboard or retrieve a link to download the video using our REST API for sessions. Raw Logs capture all the details of your Appium test, including the capabilities you passed, the timestamps of every event/action which occurred in the test and details of every Appium command your executed during your test. You can download raw Appium raw logs using the 'Raw Logs' link on the Dashboard. You can also retrieve a link to download the Raw Logs by using our REST API for sessions. Raw Logs are availible only for Appium.